Guthrie, Bayard (b. 1871) Record of John B. Guthrie, U.S.A.
Gilder Lehrman Collection #: GLC04589.02 Author/Creator: Guthrie, Bayard (b. 1871) Place Written: Ocean Springs, Mississippi Type: Typed document signed Date: circa 1900-1930 Pagination: 1 p. ; 21 x 22 cm. 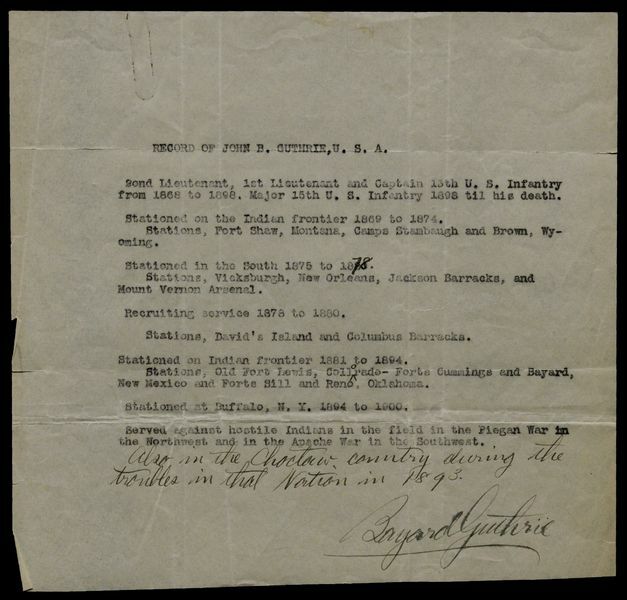 Summary of Content: Guthrie's son recounts his father's service record in the United States Army from 1868 to 1900, including being stationed on the "Indian frontier 1881-1884." During that time, he kept the field notes for an expedition against the Apache in New Mexico in 1882 (see GLC04589.01). Has a autograph addition at the bottom that indicates Guthrie also served "in the Choctaw country during the troubles in...1893." Date estimated from the end of John Guthrie's service to Bayard Guthrie's final appearance in the census records.